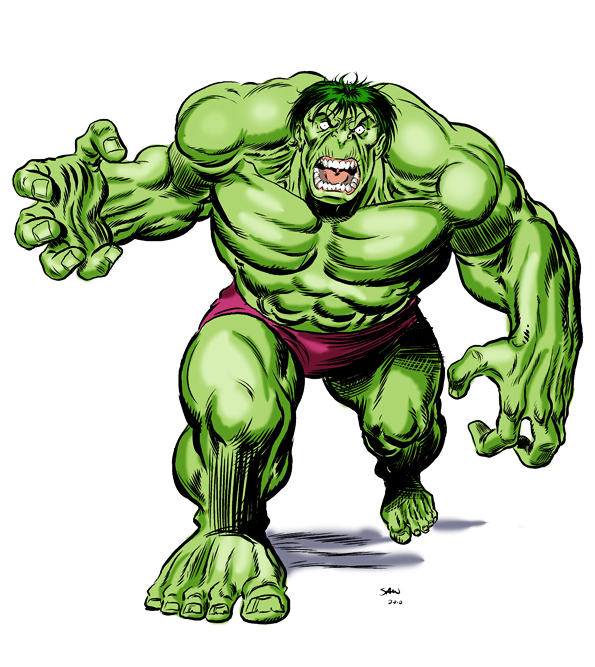 Who remembers this Hulk? It’s the mindless version of the Hulk, as featured in Bill Mantlo and Sal Buscema’s classic run on the Incredible Hulk (circa issues 299-313). After having finally gained control of the Hulk, Bruce Banner had finally found happiness and acceptance from the World at large... even getting pardoned from the Hulk's rampages by the President of the United States. However, this was not to last... as the demonic dream demon Nightmare caused the savage Hulk persona to awaken, causing Bruce Banner to lose control of the creature. Rather than sharing his existence with the savage Hulk persona again, Banner decided to commit “psychic suicide”…. leaving this truly, mindless Hulk who debuted in INCREDIBLE HULK #299, and was banished by Dr. Strange to the Crossroads of dimensions in issue 300. The Mindless Hulk... drawn in Manga Studio. Happy birthday to the Undertaker... and meeting Mick Foley! The Incredible Hulk and me. Happy 50th Anniversary to the INCREDIBLE HULK! The 60th anniversary of EAGLE.... and Dan Dare. © SImon Williams and Retro Comics Group. Powered by Blogger. Retro Comics Group, Retro Tales, The Discotronic Funk Commandos, Randy Hogan, the YMCAgent, the Maniacal Metalhead, Disco Inferno, Grimwart, M.O.H.A.W.K. and all related characters are the sole creation and property of Simon Williams and are ™ and © Simon Williams. Neither the characters, nor their names and likenesses are allowed to be used without the written consent of Simon Williams or the Retro Comics Group. All other characters are ™ & © their respective owners. No copyright infringement intended. Oh yes... I am NOT the Marvel Comics character WONDER MAN.